Radio Flyer Inc’s company headquarters in Chicago, Illinois, has earned LEED Platinum certification, the company announced this week. 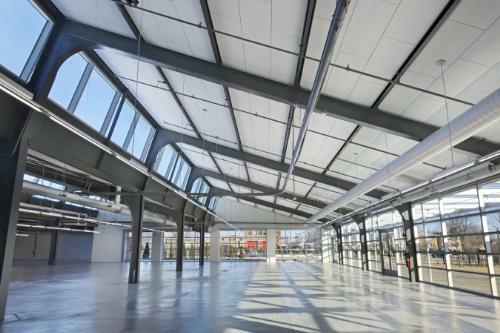 Focused on environmentally sustainable practices, the certification acknowledges the key design decisions made on the project, including the renovation of existing warehouse space, dedicated recycling areas, and geo-thermal heating and cooling systems. “Our mission is to create awesome kids products that inspire outdoor active play, so it just makes sense that we work to do our part to improve the environment,” said Robert Pasin, Chief Wagon Officer and grandson of the founder. With a mission for all employees to work in an environmentally sustainable office – and to serve as an example for other companies – Radio Flyer sought to renovate 70,000 of its 150,000 square foot space. The 70,000 square foot area was transformed into an open concept design, complete with exposed wood beams, natural lighting, an indoor and outdoor play lab, eco-friendly parking lot and landscaped “backyard” complete with native prairie plants. Geo-thermal heating and cooling systems and solar heated ventilation air have reduced Radio Flyer’s natural gas use by 50%, while additional natural light sources such as skylights and indoor glass walls have helped cut back on energy consumption. Other “green” solutions that led to LEED Platinum Certification include cisterns able to retain 10,000 gallons of storm water that is repurposed for fertilizer-free irrigation, bike storage and a locker room for employees who bike to work, a preferred parking area for high efficiency, low emission cars and dedicated areas for on-site recycling. Employees can also bring in items from home such as old shoes or clothes, batteries and electronics, helping Radio Flyer recycle an impressive 86% of waste created. To further strengthen its “green” practices, Radio Flyer has partnered with The Arbor Day Foundation to plant a tree in the United States every time a toy is purchased from RadioFlyer.com. Through this partnership, they will donate money to plant a tree in the United States for every toy purchased on radioflyer.com. So in addition to receiving a high quality, beautiful toy that will inspire smiles and outdoor play, buyers will also help make our world a better place.